Learn rock guitar from killer songs including “Paranoid” by Black Sabbath and “You Really Got Me” as by Van Halen. 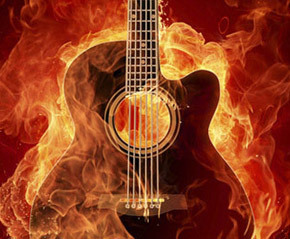 eMedia Interactive Rock Guitar makes learning guitar easy with over 100 audio- and video-enhanced interactive rock guitar lessons. You can start from ground zero, and our revolutionary teaching style will have you playing songs, chords and riffs within minutes. Soon you’ll be playing modern rock, classic rock, punk, grunge and metal. Learn from killer rock songs including “Paranoid” by Black Sabbath and “You Really Got Me” as by Van Halen. 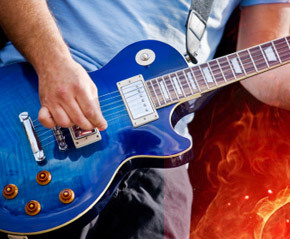 Instructor Charles McCrone, a graduate of the cutting-edge Guitar Institute of Technology with over 25 years of playing and teaching experience, takes you through all the techniques needed to play rock, punk and metal. These include movable power chords, barre chords, effects pedals, yanks, hammer-ons, pull-offs, palm muting, distorted riffs, the blues scale, using feedback, the whammy bar and more! All these techniques are applied to playing hit songs, with an animated fretboard guiding you through fingerings as the music plays. Playing exercises and riffs is more fun than ever with over 40 jam tracks. There are “Slow” and “Fast” versions, as well as “Full” and “Rhythm Only” versions. Even long after you’ve finished the coursework, you can come back and enjoy practicing your guitar technique with the jam tracks. Instant Feedback shows you when you play the correct notes on your guitar as you progress through an exercise or melodic riff. With a microphone connected to your computer and a guitar in your hands, play the notes on any screen featuring the “ear“ icon in the upper right corner and the computer will highlight the notes for you in green. As you reach your goal of getting all notes to change color as you play them correctly, you’ll discover that reading tablature is easier than you ever thought possible!